I've been making an effort to restore some semblance of order to the chaos which is my craft room and naturally have come across a selection of images, bits of card (some of which has been treated in some way) and other general detritus which all need either using up or throwing out. Those who know me well know that I don't really 'do' throwing out except in extreme circumstances so at the moment I'm in 'using up' mode. The image on this card was just waiting to be coloured, which I've now done using a mix of alcohol pen and coloured pencil; the pieces of card are all scraps which I've now die cut into useful shapes; the background paper is from my box of paper pad remnants and of course I've used three more pieces of 'card candy' - I probably have thousands of them in various colours (not counting though). I'm ploughing my way through so hopefully I should have some more cards to show you. 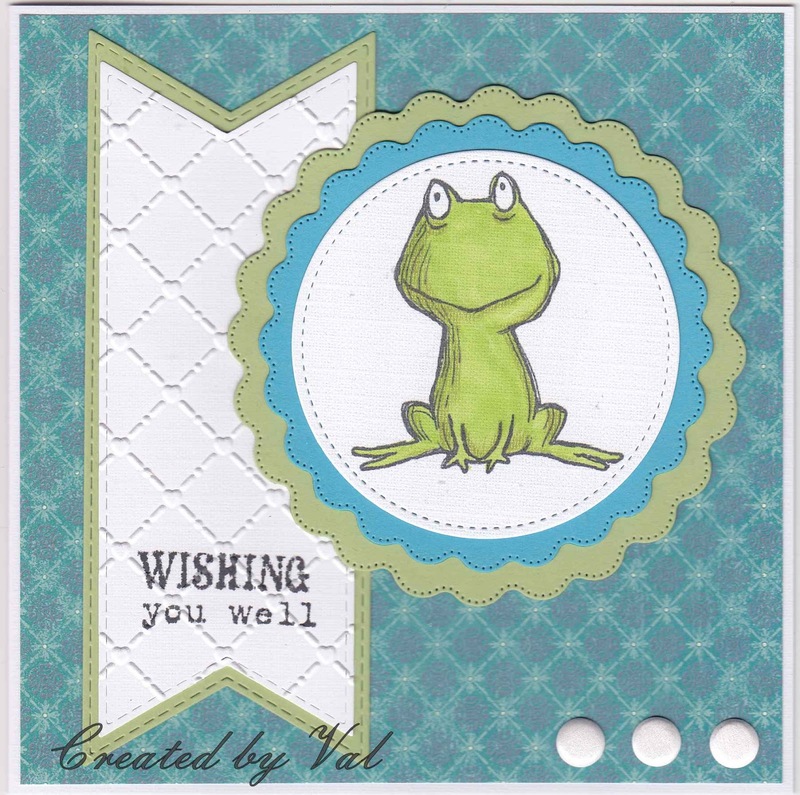 Such a wonderful card val, well done for using more of your scrap pile. I'm currently at 5 boxes of scraps and they are not small boxes. That doesn't count the printed paper pile. Think I need to be more like you. This looks sweet i love it completely. Great get well card Val it would certainly put a smile on the recipient's face.